In the waning months of 2016, the improbably named Boring Desert, a Facebook and Instagram events calendar servicing the High and Low Desert, joined a growing wave of Morongo Basin boosterism online: High Desert Happenings (curated by C/Z Records founder Daniel House — or as he prefers it, “Dåniel Høüse”); the Joshua Tree Guide (filmmaker Casey Kiernan’s tourist-themed tie-in to his local music videos and time-lapse desert photography); artist Andrea Zittel’s sprawling Hi Desert Test Sites; the Hi Desert Art and Culture Bulletin Board; Radio Free Joshua Tree’s Radio Flyer (under the auspices of Ted Quinn and the Beatnik Lounge); the Z107.7 Community Calendar; Lauren Ell of the Hi Desert; and the Tortoise Telegraph and Hi-Desert Star in print, among others – several of them now defunct. 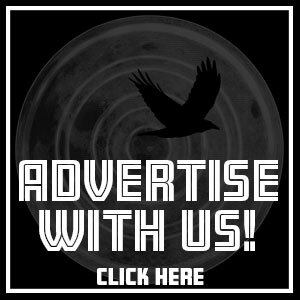 But Boring Desert is the only one that attempts an up-to-date catalogue of daily entertainment events — particularly music listings for the nearly 40 official or occasional music venues stretching between Morongo and Wonder Valleys. 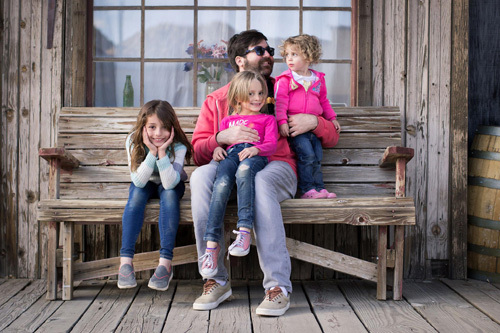 Which makes the fact that its founder is a Hollywood talent agent living in Culver City with a year-old baby all the more unlikely – and its origin myth all the more compelling. 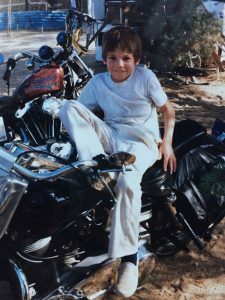 Aur-Aelion Israel (pronounced “aurillion”) was born in Pioneertown in 1981 to a hippie mom in her mid-30s in the midst of a daylong celebration and feast where everyone was tripping on mushrooms. 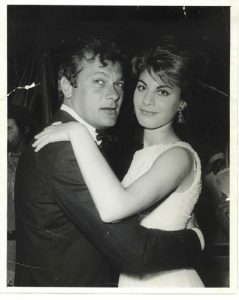 His mother, Naomi Simmons (born Rita Wasserman), had grown up a Palm Springs debutante and dead ringer for Natalie Wood – there’s a photo of her dancing with Tony Curtis at a charity event – and seemed destined for Hollywood. Instead, she worked after school at her stepfather’s car wash (Steve McQueen took his sports cars there) where, courtesy of her older, more worldly co-workers, she developed a taste for methamphetamine. After she slept through her own birthday party, her mother feared the worst and had her committed to a mental hospital. By the time she talked her way out, the ’60s were beckoning. For a time, Naomi lived at the Thompson’s Ranch Commune off Sunfair, known colloquially as Hippie Hill. Many of the denizens of that scene were captured in a painting by Dean MacKenzie titled “Mrs. Camp’s Thanksgiving Day Party,” recreated from his 1970 photo. 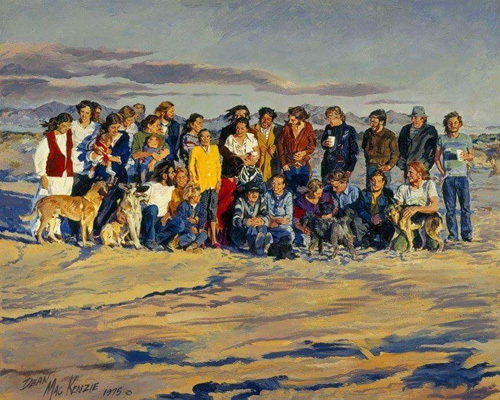 MacKenzie, an L.A. advertising and magazine illustrator frequently compared to Norman Rockwell (he designed the definitive Jolly Green Giant), discovered the 29 Palms Inn while on a personal walkabout, and routinely traded artwork for lodging with owners Jane and Paul Smith. MacKenzie made the painting in 1974, and a copy currently hangs in the restaurant just to right of the bar. Naomi is the woman in red at the very center with her face turned away from the camera. Mrs. Camp’s Thanksgiving Day Party,” by Dean MacKenzie. A copy of the painting hangs next to the bar at the 29 Palms Inn. (The original resides in the home of Jane and Paul Smith, owners of the Inn and the Campbell House.) Naomi Simmons is the woman in red at the center of the painting with her face obscured. Israel was the youngest of four children, each the product of a different union, two of whom were taken and raised by their respective fathers. (His brother was raised by Naomi’s mother.) His own father disappeared relatively quickly. “My father was 18 and my mother was 36,” he says, “so he definitely couldn’t handle her. 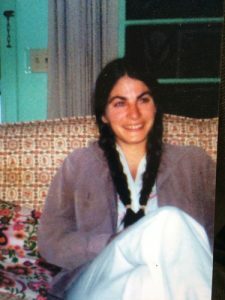 He had her come and stay with him in San Bernardino, and after one or two days, my mom ran off with his brother to San Francisco for a week, and he said that’s it.” Outside of a single encounter when he was 6, the next time Israel talked to his birth father was a phone call when he was 27, as his father lay dying of complications from hepatitis C. Israel was in foster care briefly before he was a year old, and they were briefly looked after by his mother’s boyfriend’s parents in Ashland, Oregon after the boyfriend was sent to jail for shoplifting, until Naomi’s own shoplifting arrest sent them running back to the High Desert. When she finally quit meth following her last arrest, the judge ordered her to have her teeth pulled and replaced with dentures as a condition of her probation. 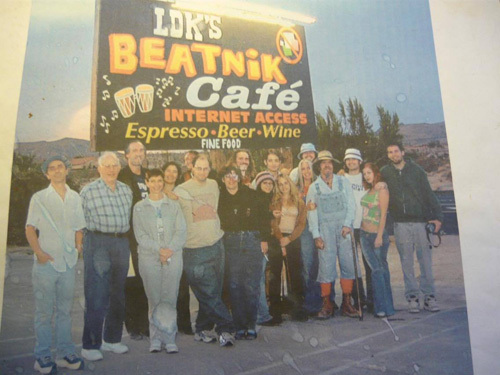 The Beatnik Lounge, October 2001; Aur-Aelion at far right. From left to right: Teddy Quinn, Stanley Kaufman, unknown, Marlene Kaufman, Veronica Gordon, Kenny Berman, Lowell Kaufman (owner), Judy Wishart, Wes Maas, Layna Marie Cooper, Leland Karlton, Klara Jolesz, Carol Ann Crandall (the Hot Fudge Sunday band), Todd Rutherford (Gram Rabbit), the Kyoti King, Travis Cline (Gram Rabbit), Jesika von Rabbit (Gram Rabbit), Aur-Aelion Israel. Israel was a member of an improv troupe in high school that performed at the Water Canyon Café (now Frontier), and was caught skipping school in his senior year when the Hi-Desert Star ran a front-page photo of him camped out to buy tickets for Star Wars, Vol. I: The Phantom Menace. He was also a regular at the Beatnik Lounge in one of its earliest incarnations, alongside the future members of Gram Rabbit and others. But as soon as he could, he left for the College of the Desert in Palm Desert, where he studied Hotel and Restaurant Management, returning for summer jobs at Crossroads, the Route 62 Diner and Pappy & Harriet’s. (Ironically, his mother had been a waitress at Pappy’s back when it was still known as the Cantina.) He also managed to produce a feature film, shot locally with a budget of $5,000. Befriending actress Kaye Ballard, a regular at the Thai restaurant where he worked in Rancho Mirage, he met acting teacher John (brother of actor Bruno) Kirby and quickly got an agent. Although his main feature credit was Cyxork-7, a sci-fi parody shot in Joshua Tree, he eventually became the agent’s assistant, and launched his own talent agency, Almond Talent, in 2007. All through his childhood, Israel had sought refuge with his next door neighbors, whose large family represented a less dysfunctional portrait of domestic life. “I was their babysitter,” he says. “When they went to Disneyland, I’d go with them. I was like their surrogate kid.” He also took an interest in shepherding their kids, who he calls his godsons, clear of the pitfalls he witnessed in his own home. A 2000 cover story in Los Angeles Magazine by Mathew Heller titled “Teenage Wasteland,” about the 1996 death of 15-year-old Lucas Bielat from GHB poisoning at a makeshift rave at Giant Rock, presents a snapshot of that pre-Instagram landscape: meth on the rise, with little focus or direction for errant youth, who are exposed to predatory opportunists drawn here by the mystic desert vibe. A decade later, this had only intensified. Having started a MySpace page in 2007 under the nondescript name 760 Promotions, he made the shift to Facebook in 2009, where he began to document some of the group activities he had uncovered to entertain his surrogate family. In 2011, he made this a primary focus of the page, rechristened it Boring Desert, and updated it whenever he could.